The Jazz are talented, deep and experienced, and expectations have gone up accordingly. Just how high can this team climb? Francisco Kjolseth | The Salt Lake Tribune (Photo illustration by Francisco Kjolseth) Jazz 2018 season. How far can they go. 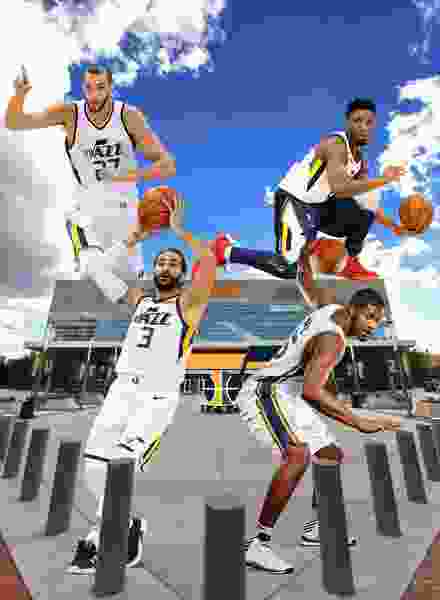 Rudy Gobert, Donovan Mitchell, Ricky Rubio and Derrick Favors. There were no external expectations of the Utah Jazz a year ago. That’ll happen when your All-Star forward leaves for greener pastures, or at least greener jerseys; when your defensive anchor misses 26 games early with a pair of knee injuries; when your new starting point guard has his worldview scrambled by an offensive scheme that frequently deploys him off the ball; when, because of all that, you start the season a woeful 19-28. Well, if there weren’t expectations before, there sure are now. What do we expect now that we’re expecting? So now, because this offseason saw the Jazz eschew bringing in outside talent in favor of returning every key player from the roster save for Jonas Jerebko (who was replaced with draft pick Grayson Allen and G-League standout Georges Niang), and saw an already-stacked Western Conference get more so by importing LeBron James, what does that mean for the Jazz’s chances? What, exactly, is this group’s ceiling? An NBA survey of the league’s general managers saw 90 percent of them pick the Golden State Warriors — who’ve won two straight Finals and three of the past four — to win the West. The other 10 percent selected the Houston Rockets. The Russell Westbrook-led Thunder were predicted to finish third, while the Jazz came in fourth. No one with the Jazz wants to make an outright prediction. But no one is downplaying the possibilities, either. “As a team, we’re gonna be the best we’ve ever been as a group,” concurred Rudy Gobert. Jazz coach Quin Snyder wants to shift the narrative a bit. In his mind, how Utah stacks up against the competition is a premature argument anyway. Starting point guard Ricky Rubio agreed. Speaking of which, Snyder wants to disabuse people of the notion that returning 13 players from last year’s team inherently limits what this year’s is capable of. Everyone involved, apparently, takes that to heart. Because when asked what the key was to Utah taking the next step, there were a whole lot of different answers. “Guys gotta be willing to share the ball, gotta be willing to move without the ball, and you gotta be willing to sacrifice sometimes,” said veteran big man Derrick Favors. “It’ll be important for us to start fast, limiting our turnovers, just continue to get better every day throughout the season,” suggested backup big man Ekpe Udoh. So despite the similarities of the rosters, it’s clear no one is taking the attitude that anything is set in stone. Lindsey pointed out that, tough as the West is, there’s as much possibility to finish on the outside looking in as there is to place in the top four. Favors made it clear he’s going to do what he can to avoid regression. That’s the goal. Just don’t call it an expectation — Snyder has no use for those, anyway. “If you think that expectations are gonna help you win games, they’re not; and if people don’t expect you to do something, that doesn’t mean you can’t do it,” Snyder said.